A software application used to organize and distribute e-learning materials, assignments, and assessments; track and calculate grades; and facilitate communication among students and teachers. That definition alone should help you get on the right track in relation to what your organization needs. However, we’ll take this time to outline the systems and their importance, in a manner that represents something more than simply what it is. We will start with the following scenario, “I have all of these learnings from a content provider, but... Using them is getting more and more difficult based on our growing staff. What do I do?” At first you may be able to gather a captive audience to abide by the growing wishes of your organization, but eventually you will most likely hit a road block. Perhaps you are even a very developed company that has somehow managed to integrate education solutions into your corporate culture. Be that as it may, nothing can compare to a well-established LMS in regards to the immediate impact of organizing learnings within your environment. Imagine a world where your marketing department has to take eLearnings that teach them about quality design practices, branding strategies, and how to type blog posts that could actually engage users. When at the same exact time, the same system could also be used by your Research and Development team to learn production best practices, lab safety etiquette, and how to explain product features to that same marketing department! Well, I am merely typing that such a world exists, and just by reading this blog, you are a step closer to understanding how to relay the importance of an LMS to people on your staff who believe your one off elearnings and office calendar trainings are more than enough to meet your company needs. 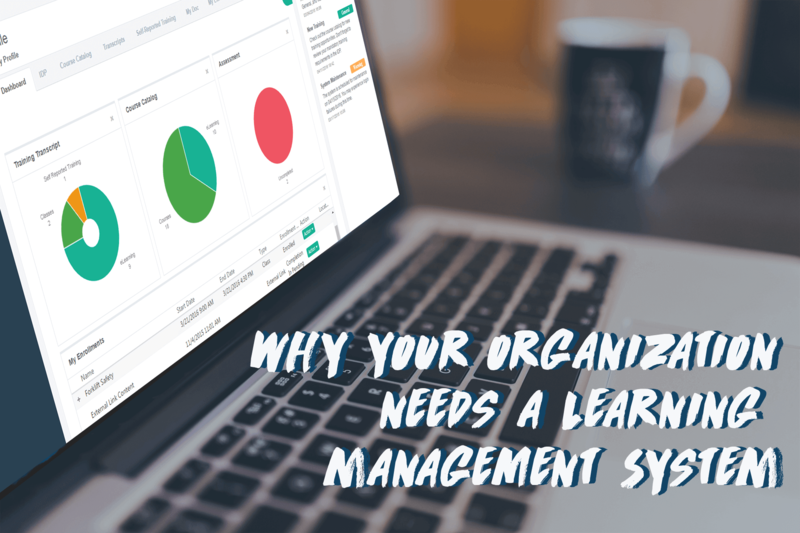 A Learning Management System does something that your boss has been asking you to do, ever since you had the bright idea to begin training your employees. It answers the age old question that has been tossed around board rooms since the beginning of time. That question being, “does this initiative actually work?” You may learn that a training you have been giving for years has been confusing your employees so much, that they’re taking the wrong information in the field. You may receive employee feedback stating that a certain training seminar is entirely too long and is impacting work output on a consistent basis. Another possibility is a course you were considering eliminating, could perhaps be a shining star that has done such a wonderful job training your employees, that a majority of your staff use the course materials as a reference book on a consistent basis. No more guessing at the effectiveness of content, receive live feedback about the quality of your organization’s learnings. Then take those learnings and track and implement across the entirety of an organization. See what employees are taking which courses when. Find out which courses your employees are avoiding, and utilize a built in notification system to alert them of truancy. In an LMS system, the world is unbounded; quite literally. So much so that if you are part of a large organization with international representation, there are even translation tools and modules at your disposal to create a more impactful training and development program. Be sure to go back to your boss’s ultimate question. This program indeed works, and now, I can find ways to make it work better. An LMS allows you to calculate return on investment, evaluate how the system is working and adjust learning measures to match organizational needs. But it doesn’t just stop there, it can help you identify issues that are plaguing your workforce, instill positive behaviors, and influence the perception your HR department. Taking a novel concept in which people are social learning and spinning it to include all the possible resources at the organization’s disposal; all while making you look like a modern day superhero. Besides organization and justifiable analytics, you gain something else immensely important. Accountability, gone are the ways of the inexperienced employee, trainings are just a few clicks away, and certifications can go a long way in establishing a credible employee base. E-Learnings and trainings, can prove compliance and bolster the work rate of the individuals within your department. It can also ward off potential negligence claims and protect you from an external audit on the abilities of your people. No more, timely, one at a time onboarding, with duplicate and incorrect information in a spreadsheet. Import all your HRIS data into one system, merge all of your SCORM learnings into one easy to use and actionable list, define the parameters of learnings based solely on the department you want them to be defined to. LMSs can do that! “We book everything in our company calendar. We don’t need that.” All of this can be done in a single platform, you can track the learning from the time it’s scheduled, to the people who participate, to the certifications they were able to achieve. In a blended learning environment, resource management is the key to truly getting your learning and development efforts on track. Learning management systems are the key your organization may be lacking. There is no better resource in existence, in order for a workforce to capitalize on learning objectives. With all the advancements in learning technology, it only seems fitting that you are aware of a product not only capable of handling new applications, but has been designed with the future in mind all along. Thanks for reading and please join me as I continue my expedition into the heart of the Learning Management Systems industry. "learning management system". Dictionary.com Unabridged. Random House, Inc. 3 Aug. 2016. <Dictionary.comhttp://www.dictionary.com/browse/learning-management-system>.